Brokers come to the Club at Tamarron’s Grand Opening. April 14th 2:00-6:00PM. 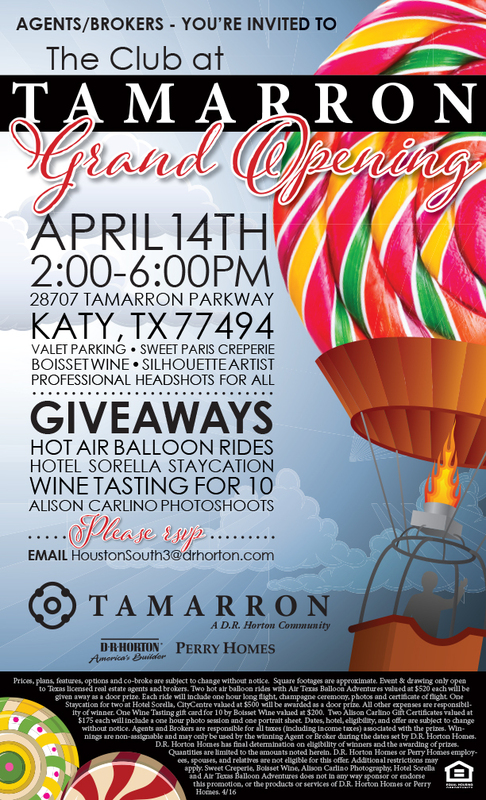 There will be valet parking, sweet paris creperie, Boisset Wind, Silhouette Artist, Professional Head Shots for All. Giveaways – Hot air balloon rides, Hotel Sorella Staycation, Wine tasting for 10 and Alison Carlino Photo Shoots. Please RSVP to drhorton! The Celebration Continues in TAMARRON! Driving Directions: From Downtown Houston, Travel West on I-10 towards San Antonio. Take FM 1463 exit. Turn left on FM 1463. At Spring Green Blvd, turn right to stay on FM 1463. Continue on FM 1463 south for 3 miles. Tamarron is on the right at the intersection of FM 1463 and Tamarron Parkway. Follow the signs on Tamarron Parkway to The Club at Tamarron!